Have you joined us on Facebook yet? 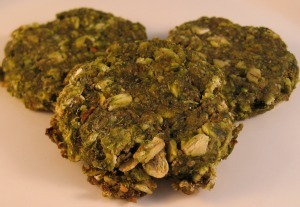 Be sure to check us out, after reading this newsletter, to keep up with new dog treat recipes. Plus, read my answers to other dog treat bakers questions. As always, you can also read this newsletter online. Baking with gluten and/or grain free flours can seem like a daunting task. Where do I start, where do I get them and will my baked goods turn out ok? Almond flour, also called almond meal is becoming much more accessible. Most major grocery stores will carry it, but you can also find almond flour online in larger quantities and brands. Tapioca flour, also called tapioca starch or tapioca powder, helps to replace the texture of gluten in your gluten free dog treats. Tapioca flour can be found in major health food stores, but of course, it can also be found online. In a small bowl, beat the egg. Then stir in the cheese and olive oil. Pour the cheese mixture into the flour mixture and stir with a fork until thoroughly combined. Measure and cut out a piece of parchment paper to fit your baking sheet. Place this piece on your counter top. Next, place the cheese dough ball onto the parchment paper and cover with another piece of parchment paper. Using your hands or a rolling pin, flatten to a very thin consistency, around 1/16 inch. Using a pizza cutter, cut 1 inch by 1 inch squares. Bake for 15 minutes. Leave the treats in the oven to cool after the oven has been turned off. Yield & Storage: Cutting the treats into 1 inch squares should yield you about 75 treats. 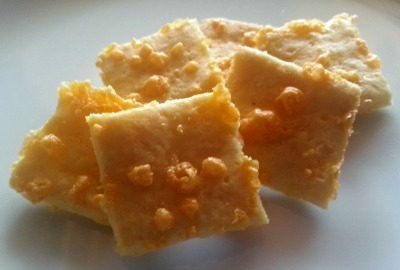 These cheesy dog treats should be kept in the fridge for up to 1 month or in the freezer for up to 6 months. February is filled with love, but don't forget to take special notice of your dog this year. You can help to strengthen the health of your dogs heart by making a couple heart conscious dog treats. Dog parents are becoming more and more aware of the dangers of commercially made dog treats. Be the first in your area to start your own dog treat bakery. Start by reading my review of a very helpful book on How to Start Your Own Dog Bakery Business. I almost couldn't believe it myself, it's already been 6 years since I started this newsletter. My very first mailing went out to 34 people, and now we're in the 10's of 1,000's. Thank you all so very much for continuing to listen to my musings of dog treats and new ways to love our sweet companions. Do you ever wonder how I got started? It's actually quite simple. I had a strong desire to work from home, but I didn't know where to start. I didn't want to spend a lot of money to get started or fall into a scheme where all I did was call people and try to sell them something they didn't want or need. That's when my husband and I stumbled upon SBI! a company that helps you to not only build a website, but to build an actual business. Please don't think that I'm unique. There are so many people who have created fun, profitable online businesses with SBI. Take just a moment and read about the overwhelming proof and case studies from hundreds of satisfied people. 15 Easy Dog Treat Recipes with 5 Ingredients or Less! 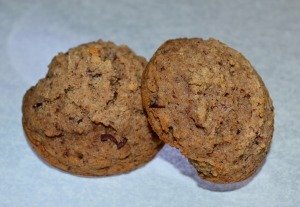 Then you can make endless amounts of healthy, yummy, tested dog treat recipes that are already being enjoyed by countless dogs. "This is a compilation of some very tasty sounding and easy recipes that any and every dog would love to chomp!" "You have an amazing website!" "I love your website and have tried a few of your recipes for my dogs. Thank you so much for sharing your great recipes with us."